This line of acrylic wall mounts can be used with signs and exhibit displays in many environments, including public schools, office buildings, hotels, conference rooms and more. The Casper invisible series Invisi standoffs are easily removeable, and they feature a barrel length of 11/16” and a diameter of 9/16”. 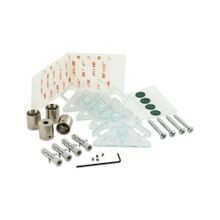 These standoffs come in a kit that contains everything needed for a smooth installation, including adhesives, screws and anchors, and removeable mounting glides. Outwater stocks these standoffs in our Arizona and New Jersey facilities in order to provide faster and more cost-effective shipping to all our customers. If you cannot find the standoff that fits your project, please contact our friendly sales staff for more information on Outwater’s entire collection of standoffs.